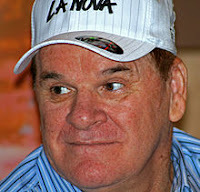 When Pete Rose, known as Charlie Hustle, was discovered as having gambled on professional sports games, he lost his place in American baseball history. Look who he was and then consider how he fell. Rose played from 1963 to 1986, and managed from 1984 to 1989. Rose is the all-time Major League leader in hits (4,256), games played (3,562), at-bats (14,053), singles (3,215), and outs (10,328). His teams won the World Series three times, three batting titles, one Most Valuable Player Award, two Gold Gloves, the Rookie of the Year Award, and also made 17 All-Star appearances at an unequaled five different positions (2B, LF, RF, 3B, and 1B). In August 1989, three years after he retired as an active player, Rose agreed to permanent ineligibility from baseball amidst accusations that he gambled on baseball games while playing for and managing the Reds, including claims that he bet on his own team. In 1991, the Baseball Hall of Fame formally voted to ban those on the "permanently ineligible" list from induction, after previously excluding such players by informal agreement among voters. In 2004, after years of public denial, Rose admitted to betting on baseball and on, but not against, the Reds. Wessel Johannes "Hansie" Cronje was a South African cricketer and captain of the South African national cricket team in the 1990s. He died in a plane crash in 2002. He was voted the 11th greatest South African in 2004 despite having been banned from cricket for life due to his role in a match-fixing scandal. In cycling, Lance Armstrong (born September 18, 1971) is an American former professional road racing cyclist. He previously won the Tour de France seven consecutive times from 1999 to 2005, but was stripped of those victories in 2012 after a protracted doping scandal. I get it, gambling and fixing games is illegal and immoral and very much out of bounds for a sportsman, whether in baseball, cricket, boxing and the like. Here in Australia,, according to Channel 9, after crisis meetings with the National Rugby League were scaling back the use of Tom Waterhouse within its coverage after conceding his role between bookmaker and commentator had been ‘blurred’. And using illegal substances to assist in victory, that's clearly wrong. Last year five Gold Coast Titans rugby league players and Queensland Reds rugby union player Karmichael Hunt were stood down after they were charged over allegations related to drug supply offences. But lately a new type of morality is being required of sportsmen which seems of a different category. This time it's related to drinking alcohol, taking drugs (not for doping, but for pleasure), and being sexual outside of traditional marriage. Somehow, all of these are wrong for role models like professional sports people, although they are glorified on our television and movie screens every day. Helen Razer writes a weekly column for Daily Review, and were her language PG instead of R-rated, I would offer her actual website to read. Instead, I'll simply quote from her article from last August, "DON’T LOOK FOR MORAL GUIDANCE FROM SPORT STARS – OR SPORT WRITERS". She said after Nick Kyrgios acted unbecoming for a sportsman, "We must also say that people who are good at sport carry with them not only exceptional statistics but the moral responsibility for an entire nation. And this is why an unremarkable citizen can become the “greatest Australian ever” [she references Sir Donald Bradman] and why Kyrgios can make local headlines for a week for saying just what many overpaid 19-year-olds with risky haircuts are bound to say until they grow up and out of fashion." Kirk O. Hanson and Matt Savage wrote about this in their 2012 article, "What Role Does Ethics Play in Sports?" published in Santa Clara (Calif) University. "Some argue for a "bracketed morality" within sports. This approach holds that sport and competition are set apart from real life, and occupy a realm where ethics and moral codes do not apply. Instead, some argue, sports serves as an outlet for our primal aggression and a selfish need for recognition and respect gained through the conquering of an opponent. In this view, aggression and victory are the only virtues. For example, a football player may be described as mean and nasty on the field, but kind and gentle in everyday life. His violent disposition on the field is not wrong because when he is playing the game he is part of an amoral reality that is dictated only by the principle of winning. An ethical approach to sport rejects this bracketed morality and honors the game and one's opponent through tough but fair play. This means understanding the rules and their importance in encouraging respect for your opponent, which pushes you to be your best." So who decides on the morality and ethical standard to which all professional sports people should comply?